How many times have you wound the yarns and ended up spending countless hours untangling it? Well if you are like me who wind your yarns a lot before crocheting or knitting, here are some tips for you. This technique is especially useful when you work with a slippery yarns such as nylon or a certain type of silk. I would call this method making yarn donut casing. With this method you are encasing each ball and pull one end while the ball stay inside the case. 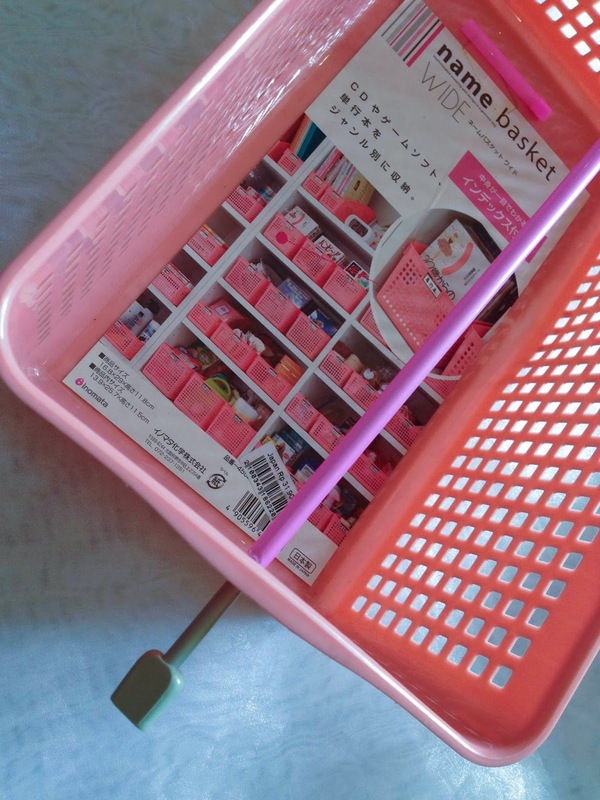 It will make your yarn ball hair and dust free too. You need a plastic pocket in the size to fit the volume of your yarn ball, not too loose and not to tight. Umbrella yarn winder and a ball winder is needed but it is not a must. 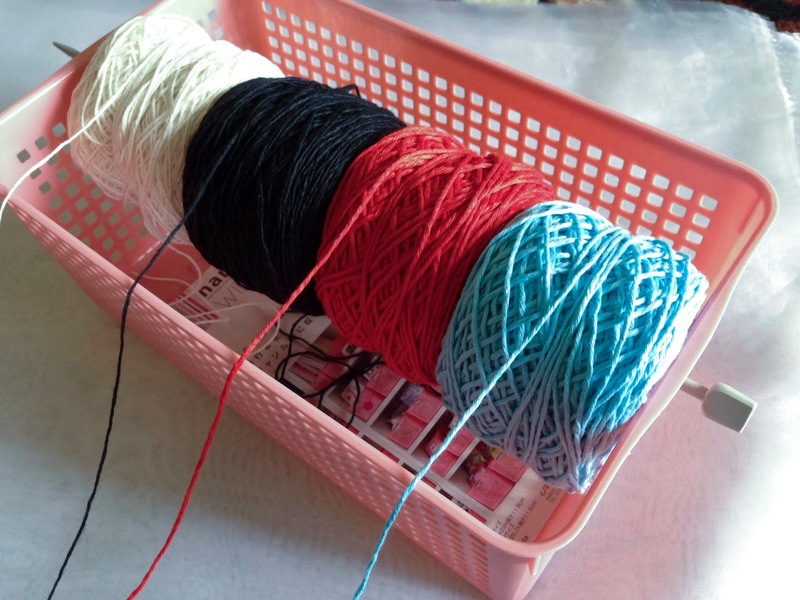 If you are manually winding your yarns, just make sure to put something hollow to temporarily hold your yarns such as a bathroom tissue paper holder. First method: Cut the base of the plastic pocket, slide it into the ball winder then tighten it with a rubber band. Wind yarns as usual. When finish, remove yarns from the winder then pull out one end of the plastic pocket gently and fold it around the yarn enveloping it inside safely. Second method: Wind yarns as usual. When finish, remove yarns from the winder, slide in the precut plastic pocket through the hole then pull out one end gently. Fold the plastic around the yarn enveloping it inside safely. Green Method: I have not tried this but maybe a a crumpled old magazine paper might work as well as a wrapper. Don’t forget to reuse and recycle the plastic containers. 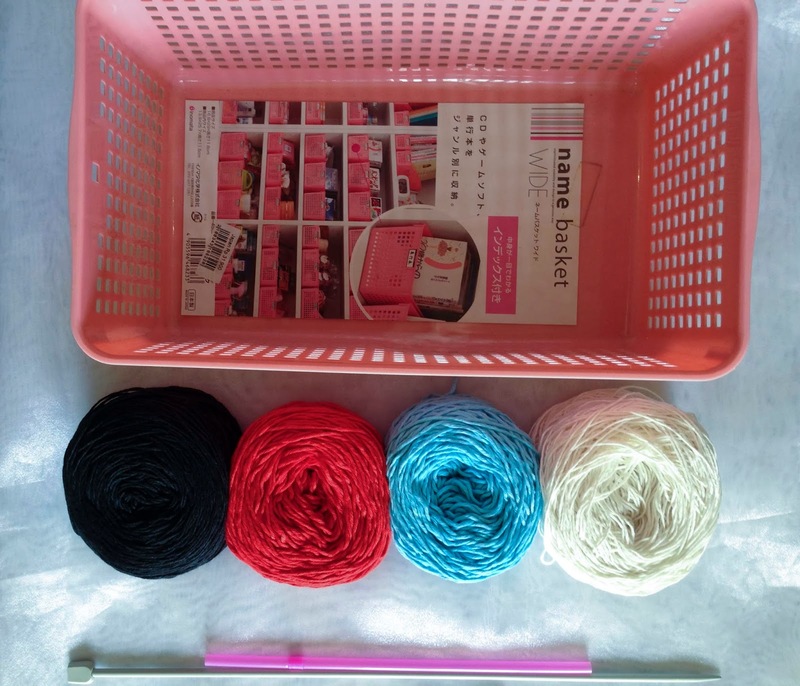 Here is one yarn organizing idea for you. I have uploaded this yarn roller idea in a fb group before which received remarkable feedbacks but have never published it in this blog. Now people are asking again for the same ideas so I thought I will post it here for easy reference for all. Slide the needle inside the straw, if more straw is needed to cover the needle cut another straw. Locate the most top hole on one side of the box. Slide the straw covered needle through the hole, string the cakes carefully, pass the needle though the opposite side of the box. Now you have it. Turn your work from time to time to avoid tangling. When stringing the cakes make sure you pull the threads all in the same direction toward you. If you prefer you can insert each of the threads through the holes in the box to separate them. Get the box from Carrefour outlets or from online store such as Organizeit. teGuess what excited me so much today? Oh, I can’t wait to share this with you. If you are into tapestry or fillet crochet, you must look at this. And best of all, it’s free. If you scroll down to my previous post you will see my post on creating tapestry graph using Adobe Illustrator. Ah well, forget about that for now. Just look at these two I created using Stitchboard.com The way the stitched sits on top of each other perfectly mimicking those of the crochet graph, slanted. I mind you that I have not tested this pattern. This software creates for you the patterns for your beading, crochet, cross stitch and knitting. Stitchboard.com provide 8 steps in creating your pattern. Step No. 8 is for member only and membership is free. a) Color Palette Desired: a) any palette among the 3 b) Automatic closest color match or choose your own colors c) Colors desired in the final pattern: Choose any form : limit the number of colors, shades of gray or black and white. 6. Enter the number of stitches across. 7. Select your output from the two options: save as PDF or pattern on screen. And you can ask the program to create grid for easy reading. Omit step 8 if you are not registering yourself as member.